Each product may be purchased separately but for best results and greater savings, we recommend purchasing the entire package. Kidney Terrain Wonderful product for cats and small dogs with kidney disease. Easy to administer. At Ask Ariel, we specialize in treating feline kidney disease and canine kidney disease. This is our most popular product for cat CRF and is recommended frequently by veterinarians whose clients have benefited from it. Just put a few drops of Kidney Terrain on your cat's tongue or lips and you will help give them vital support to help their kidney disease. Kidney Terrain works best when used in conjunction with Kidney Health (helps your kitty to break down and utilize protein) and Oxicell SE--full spectrum antioxidant support. 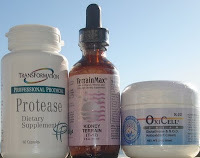 Thus, we offer the products together at a discounted price as the Kidney Support Package. Kidney Terrain is a powerful, state-of-the-art homeopathic formula that provides herbs, nutrients, essential ionized co-enzymes and cofactors for supporting the kidney. It provides supportive enzymatic activity, drainage and detox processes, cellular micro-nutrition and meridian balancing. Nettle leaf, dandelion leaf and parsley leaf provide further support for this powerful formula. This product has been helpful for pets with kidney failure. Kidney Terrain works especially well when used in conjunction with Oxicell SE (contains CoQ10) vital for kidneys and Kidney Health (enzyme that helps break down protein). Oxicell SE is an excellent value. One tub can last between 6 -12 months for 1 cat. If you are not able to give your pet CoQ10 capsules, this topical antioxidant cream contains CoQ10 along with many other vitamins and minerals helpful for kidney disease. Owners report that their kitties have increased energy and are more playful! Kidney Health is an extremely important enzyme that helps break down the protein in food and also helps your pet's body eliminate toxins associated with poor protein metabolism. The capsules contain powder that can be easily mixed into food. There is minimal if any taste so the powder is well tolerated by even the most finicky pets.